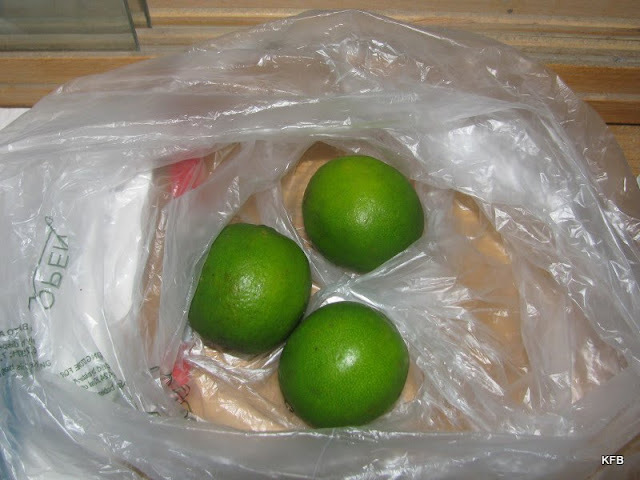 Limes for John's juice fast. My citrus of choice, most of the time. I've been cutting back on soda, even though I only drink diet, and experimenting with water and flavored water. 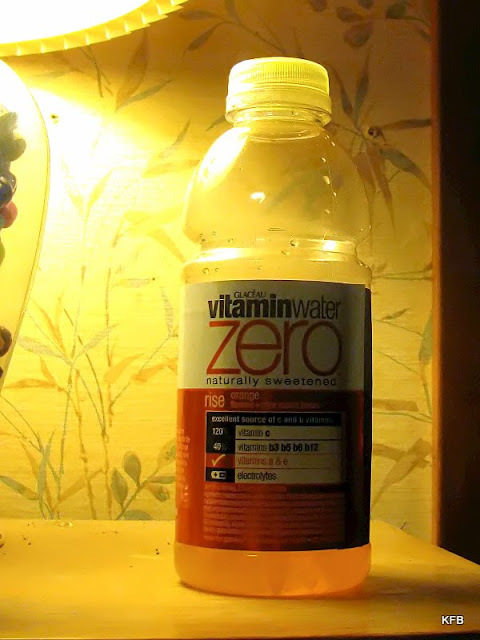 This is an orange flavored water, lit by orange light. 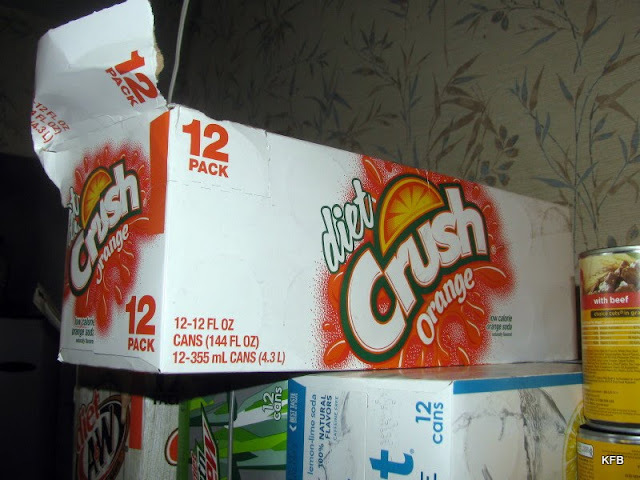 It's not as good as Diet Sunkist or Diet Crush. I'm not sure it's even better than basic Arrowhead water. We've been working on having home-grown citrus. John planted this tangerine tree about two years ago. Tangerines were my favorite until I discovered clementines. 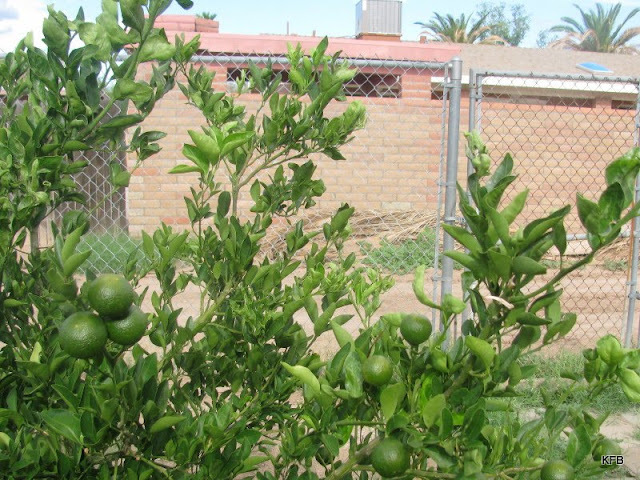 This grapefruit tree, planted within a month or so of the tangerine one, barely survived last winter. 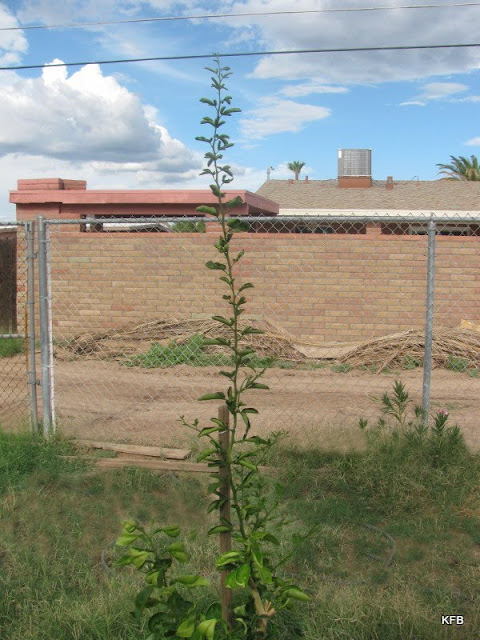 It replaces a mature grapefruit tree that died about four or five years ago. I'm not a fan of grapefruit. At all. Hi ho! This week's Round Robin Photo Challenge topic is "Hidden." I'm sure I had something in mind when I came up with that theme, but I've since forgotten. 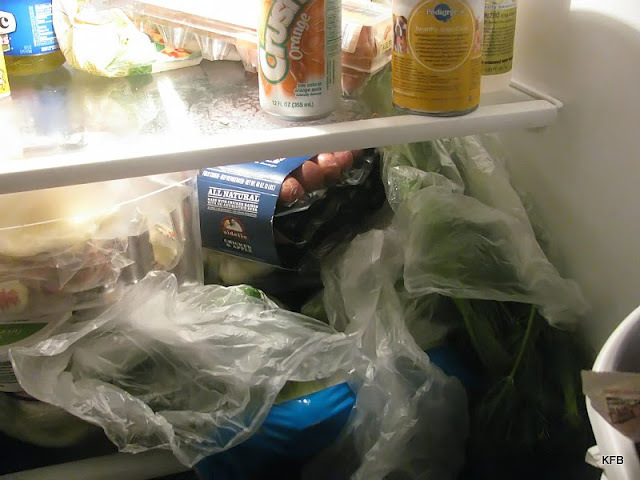 Still, there is one place where stuff gets hidden on a frequent basis: the fridge! 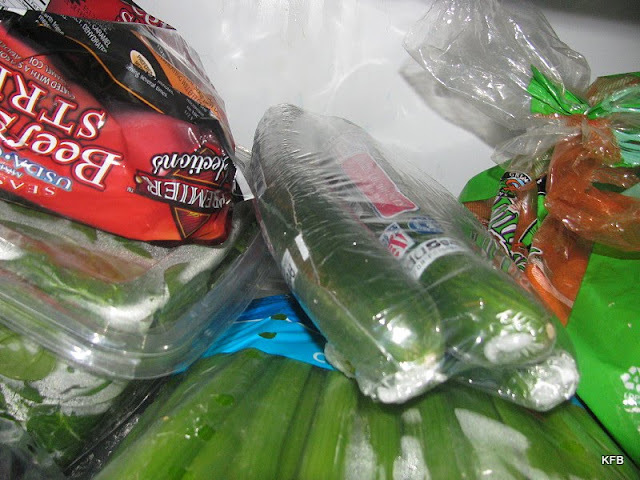 John's on a juice fast, so the refrigerator is especially full of fruits and veggies, plus my low carb stuff. 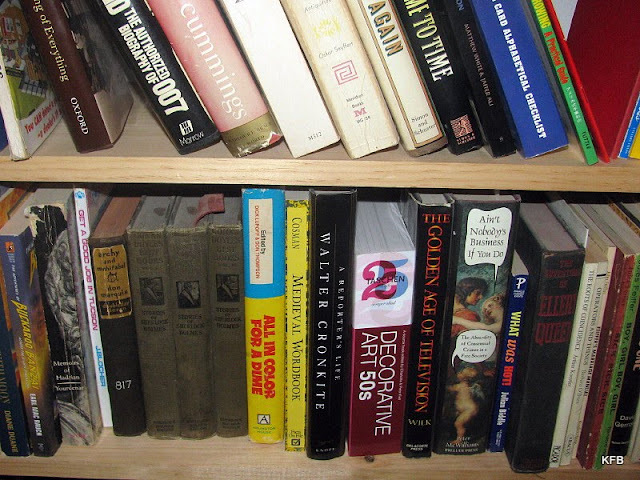 But as the shelves fill up, older stuff gets pushed to the back, or buried under the new stuff. And I'm looking for my mini-cucumbers. Are they hidden under the fresh anise and apple-chicken sausages? What is hidden under and behind there? 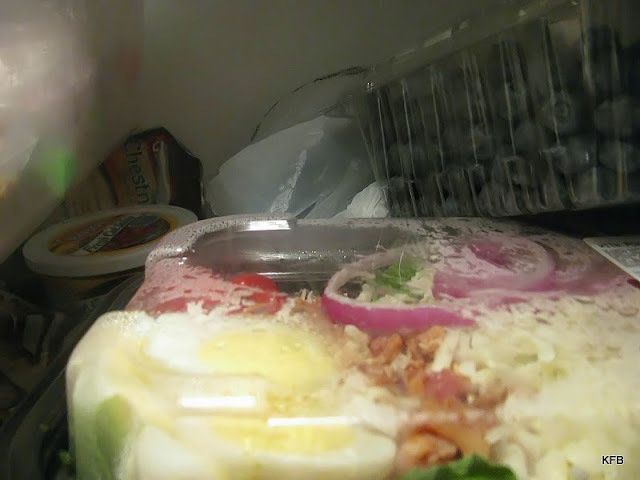 Well, there's my spinach salad, and a big thing of blueberries, and...I'm not sure I really want to know what's in the back! How about the bottom shelf? 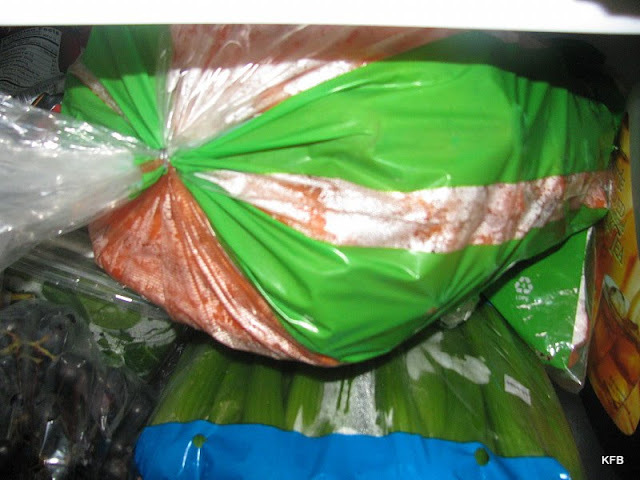 What's hidden under and behind the five pound bag of carrots? Well, there are some cucumbers. But they're John's extra large ones, not my mini-seedless ones. Somewhere on this bookshelf is a more...deliberate hiding place. Can you spot it? 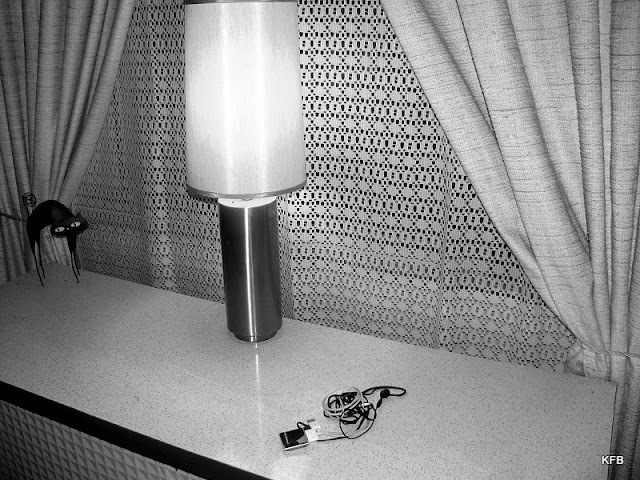 Hey, folks, anyone else want to photograph what is hidden? 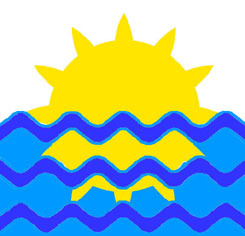 Check out the Round Robin blog for details! This week Carly wanted to see butterflies for the Ellipsis Monday Photo Shoot. 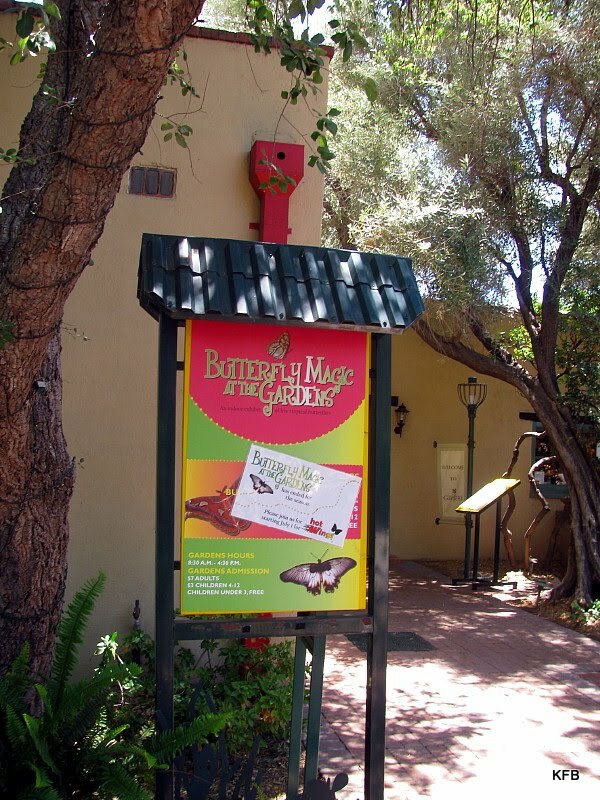 If I were still working in Marana, I would have stopped off in Oro Valley on my way home and looked for some, but as it was, in this hot, monsoon-locked city, I knew the chances of finding any butterflies right now were slim to none. So let's hit the archives! 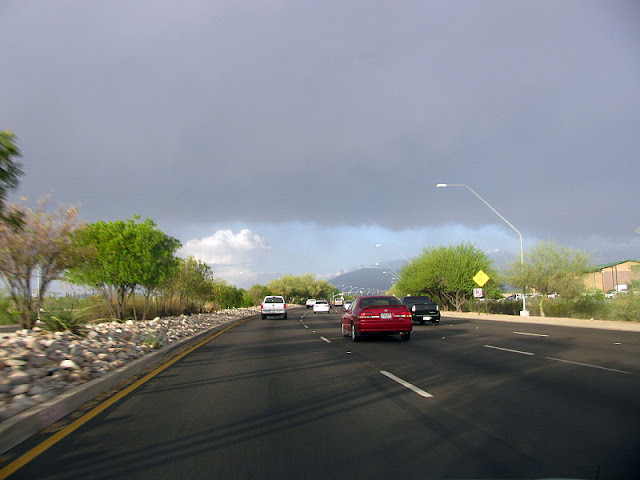 In the summer of 2008 I had a temp job for three months in Oro Valley, Arizona, on a road that had a lot of fields and flowers. I spent quite a few lunchtimes trying to capture butterflies with my camera. I was never all that successful, but I did get a handful of good shots and some fairly decent ones. This was one of the better ones. Here's another, in the fairly decent category I suppose. 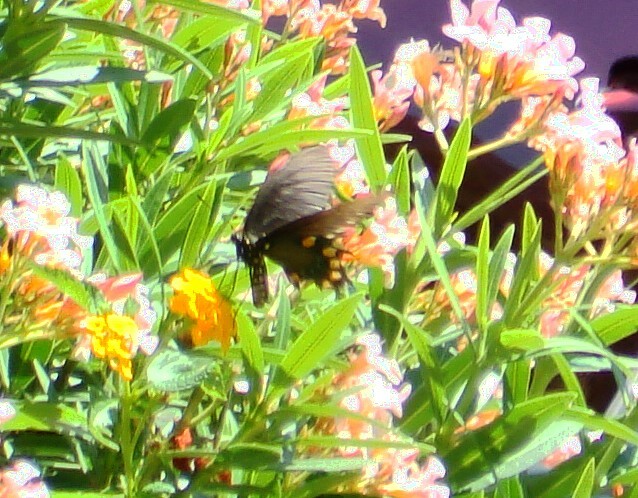 I'm pretty sure this was a pipevine swallowtail, although the light in this case makes it look more brown than black or iridescent blue. And by the way, there's another insect I managed to photograph that summer. I have no idea what it is. 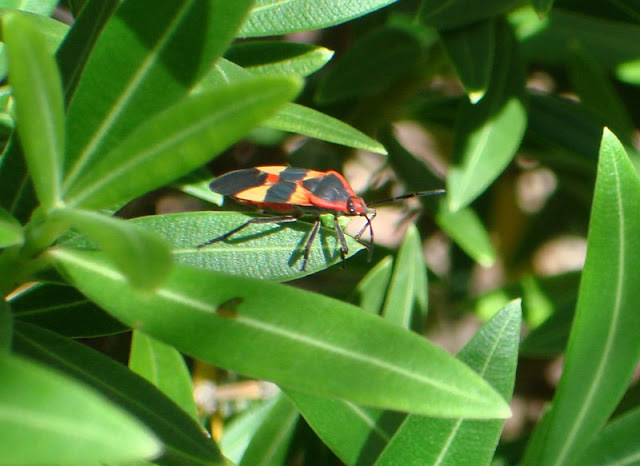 ETA: It's a Large Milkweed Bug, which is a "true bug" rather than a beetle. Apparently there's a lot of variation in the colors (red to light orange) and markings. 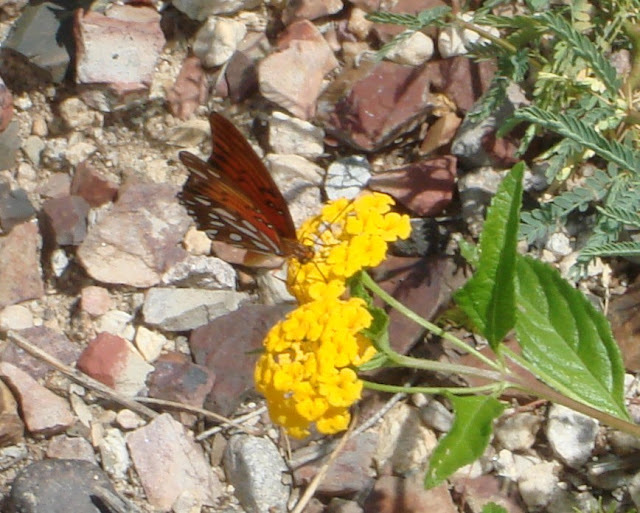 You can see more of my shots from that summer in my Picasa album Butterflies of Southern Arizona. 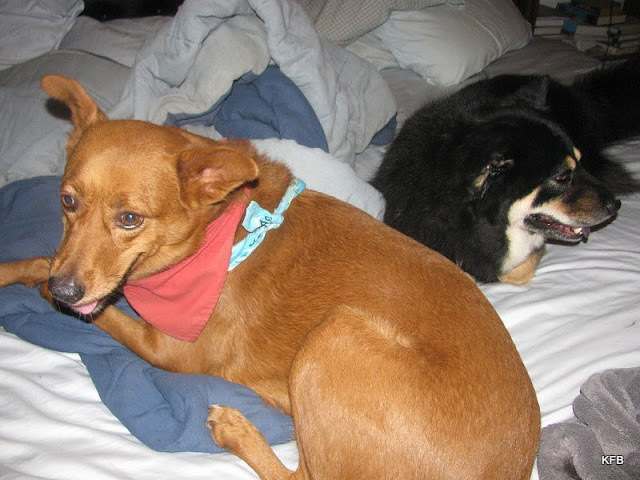 That was also the summer that my dog Tuffy died. 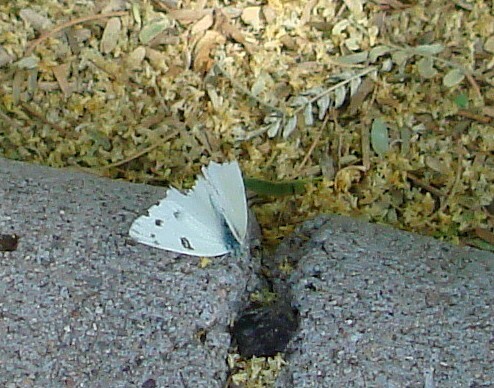 On one of her last trips to the vet, I saw this butterfly just outside the vet's office entrance. 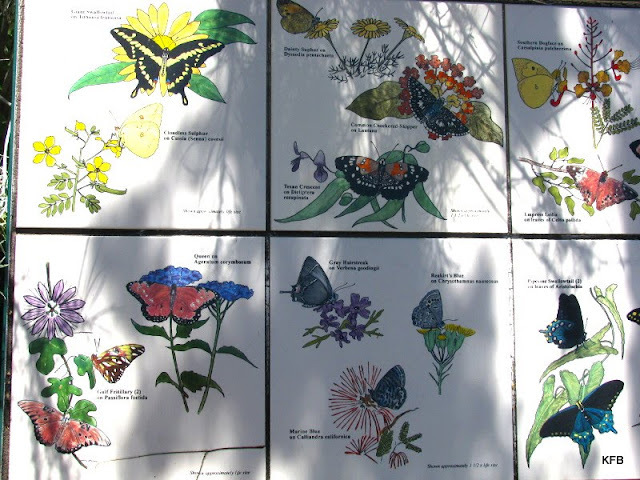 Last summer's afternoon at the Tucson Botanical Gardens was rather pleasant in many ways, but when it came to butterflies it did not live up to its advertising. Aside from one shot of a real live butterfly, I had to settle for pictures of butterflies, such as the ones on these tiles. 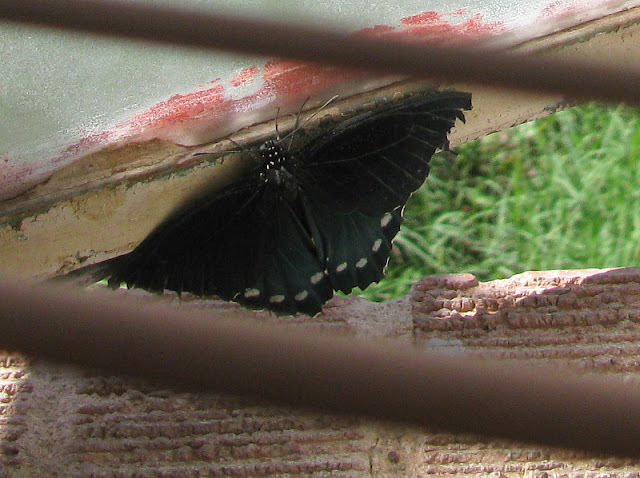 This is a pipevine swallowtail (probably) that I sort of rescued from my bathroom window last August. Poor thing was much the worse for wear! Epic! I can almost hear David Tennant's Hamlet declaiming it. 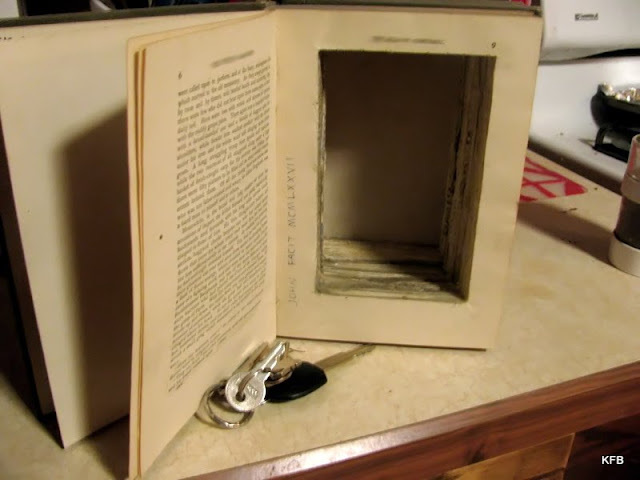 The text above is untouched except to leave out the links and to break up the block of text into lines of poetry. Commas and lack of periods are as they were. 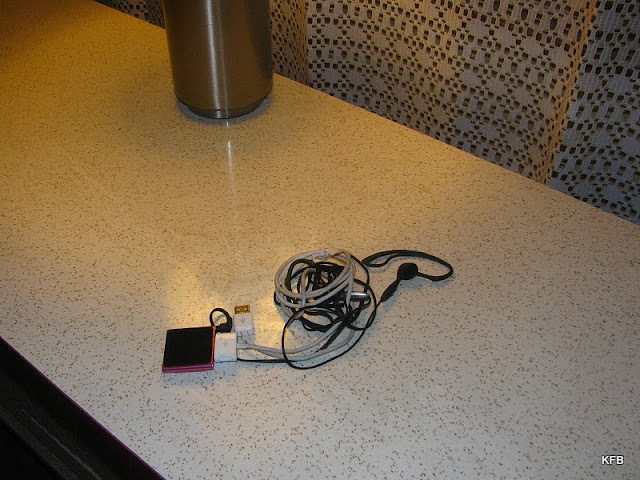 The title of this week's Round Robin Photo Challenge, "Something Old, Something New," is self-explanatory, but I'll explain anyway. The idea (first suggested by Ruth, the ScrabbleQueen) is to show old and new examples of the same basic thing. My old and new things are buildings, two blocks apart on Broadway Blvd in downtown Tucson. 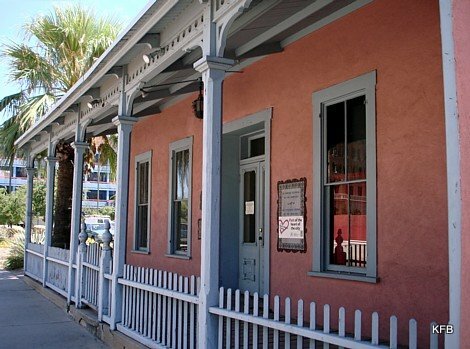 This is the Charles O Brown House, reputedly the second oldest building in Tucson. Another source lists it as the very oldest, dating to 1840. Brown purchased the small adobe house in 1868, and expanded it at least twice over the next two decades. 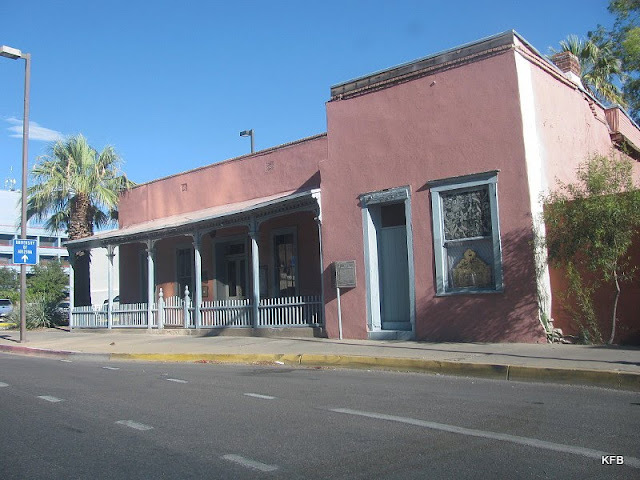 Its rival in Tucson's pre-Gadsden Purchase, very-old-homes derby is La Casa Cordova (circa 1848), which is now part of the Tucson Museum of Art and Historic Block. The house in 2007, the day I first noticed its existence. I first found out about the Charles O Brown House while on a stroll downtown when I had jury duty in 2007. For the past several months I've been driving past it nearly every day on my way home from work. That ended today, at least for the time being: I've just been laid off today from my non-church job in Marana. I'm not going to write about the layoff, except to say I hope to work there again eventually. 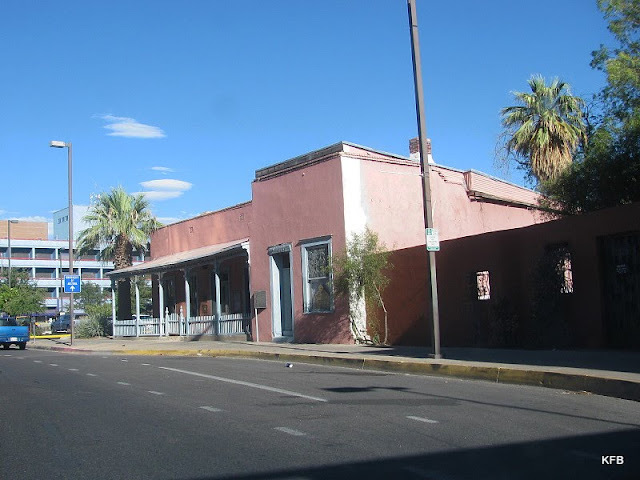 Until very recently, this mid 19th-century blend of Mexican and Victorian architectural styles was leased out by the Arizona Historical Society for $1 a year to a company that was supposed to help restore it. They didn't, and the adobe walls are in sorry shape, which threatens the building's structural integrity. If you look back at my photos of Fort Lowell from 2009, you can see what time and water do to adobe unless it's cared for: it wears away and crumbles back into the earth from which it was made. Even in my drive-by photo above, you can see the patched, unpainted stretch of wall on the west side of the building, and the rotting wood above the door. Now that the neglectful tenant that was supposed to manage the property is no longer in the picture, let's hope that something will be done to preserve this historic old building. 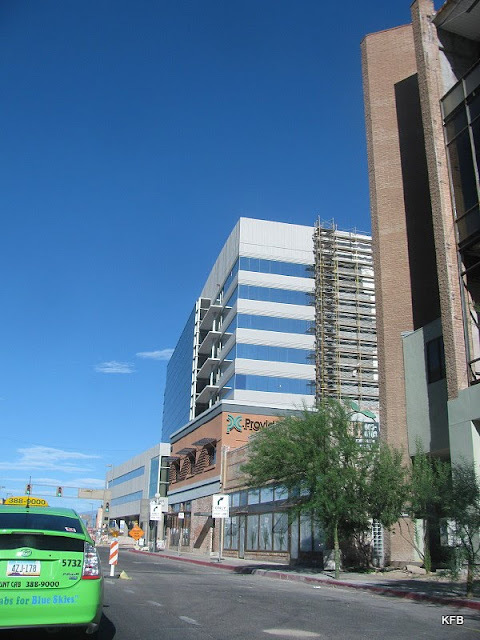 This is the newest building in downtown Tucson, more or less, so new they haven't finished building it yet! 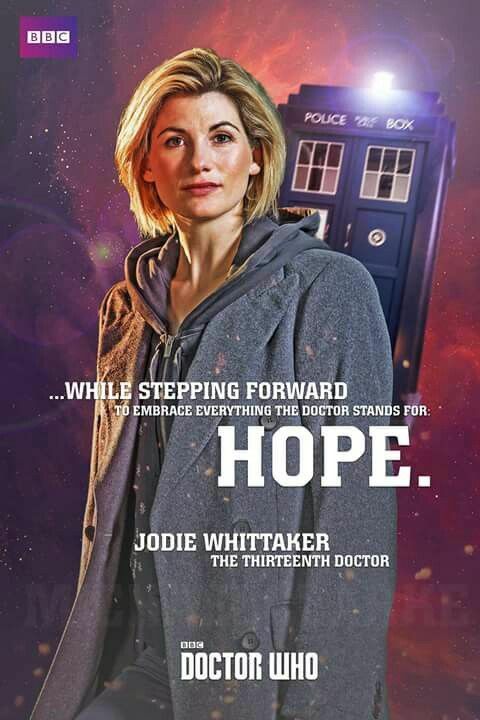 (The scheduled completion date is this December.) 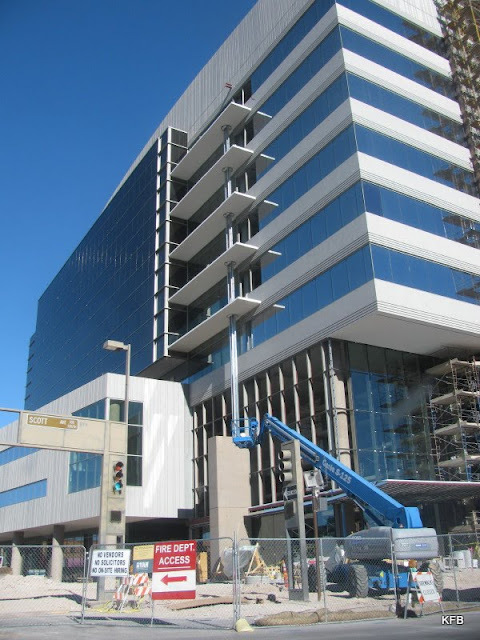 It's to be the new headquarters of UniSource Energy, the parent company of Tucson Electric Power. The current UniSourse HQ is the Unisource Energy Tower, one of the tallest buildings in Tucson and located even closer to the COB House. The really neat thing about this building, aside from the unique asymmetrical design, is that it's designed to be very green in the ecological sense, and energy efficient. 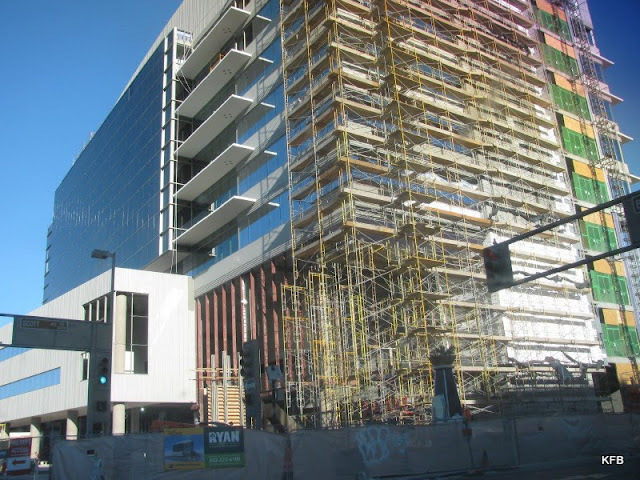 The nine story, 170,000 square foot building is to have solar panels built into its south and east walls, according to the initial press release from last year, and the design is meant to minimize exposure to the brutal Tucson sunshine. Its garage will include electrical vehicle charging stations. The not-so-great thing about this building is that it's on the site of the historic Santa Rita Hotel, which was torn down a couple of years ago. Well, not exactly. The 1904 hotel was torn down in 1973, and replaced with another hotel of the same name that lacked the beauty or historic significance of the original. If you Google images for "Santa Rita Hotel Tucson," you'll find some really striking pictures of what Tucson lost long ago. May we do better with the Charles O Brown House! Now let's see what old and new things the other Robins have to show us! 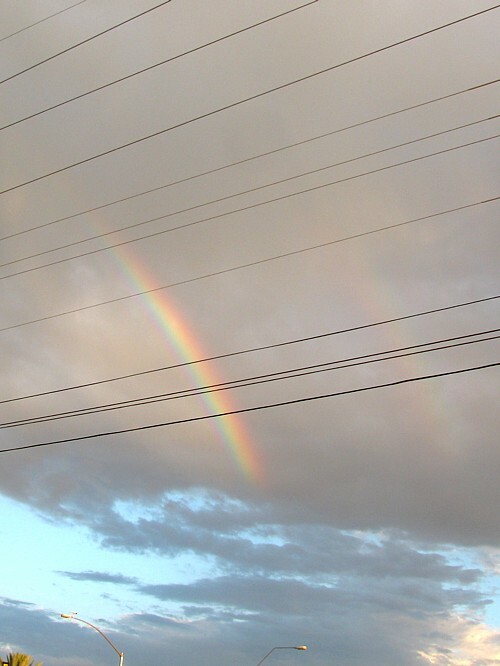 When Carly announced that this week's Ellipsis Monday Photo Shoot was about Rainbows, I thought, "Great timing! The monsoon has started, and it's raining almost every day here. All I have to do is keep my camera with me and watch the sky on my way home from work." 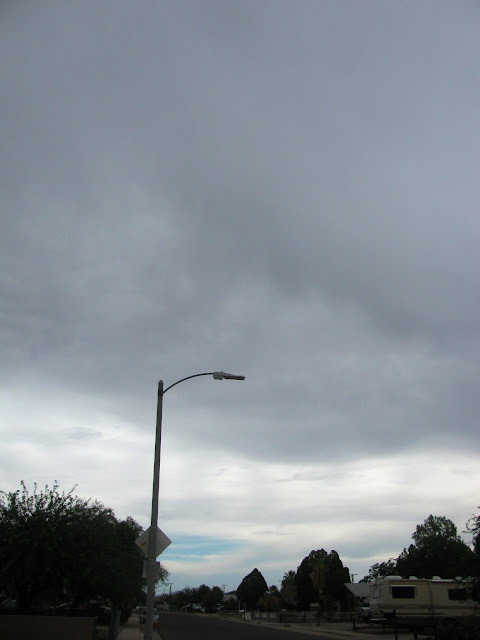 Then the monsoon weather in Arizona went away for a bit. Today there was not a cloud in the sky. Foiled again! 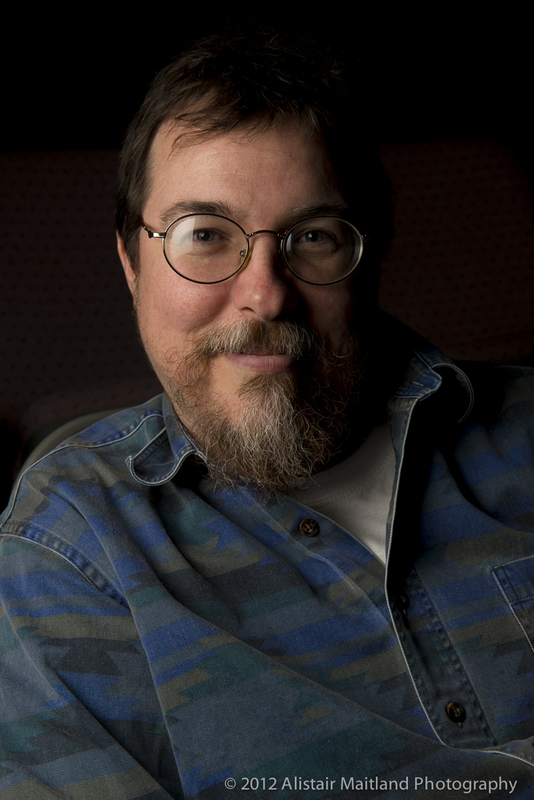 Jun 26, 2009. A Double! As best I can tell, I've never posted either of those shots before, although I did edit them at the time. If the monsoon comes back by Sunday, I'll add something new. 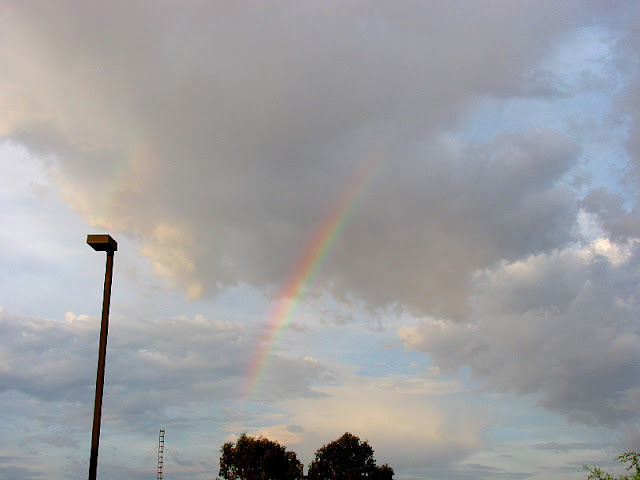 I really did see a rainbow just the other day - but I was driving and it was gone two minutes later. D'oh! It was a really faint one anyway. 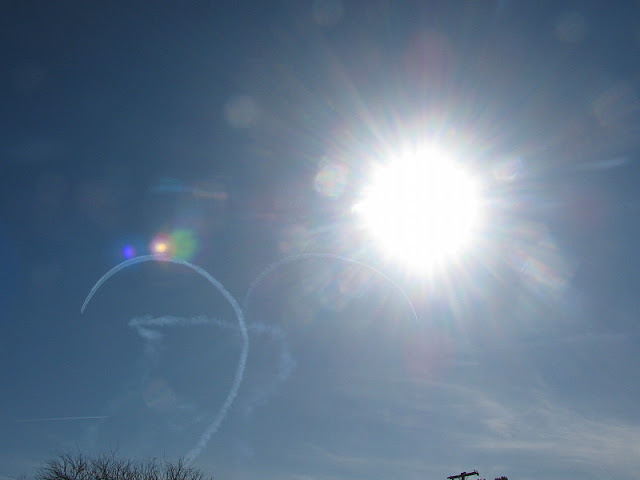 This is one of the shots I took while trying to photograph planes as they flew over Calle Mumble during an air show in 2010. 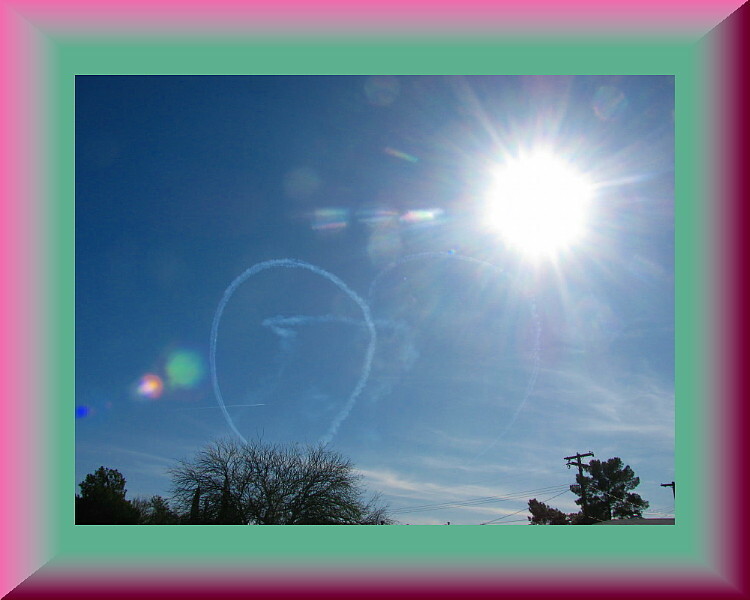 The planes I'm trying to follow with the camera frequently go "climbing high, into the Sun," as the Air Force Song puts it, with colorful results! And this is the next shot I took that day. At Carly's suggestion, I've put an SFX frame around it. The topic for the Ellipsis Monday Photo Shoot this week was Looking Up. 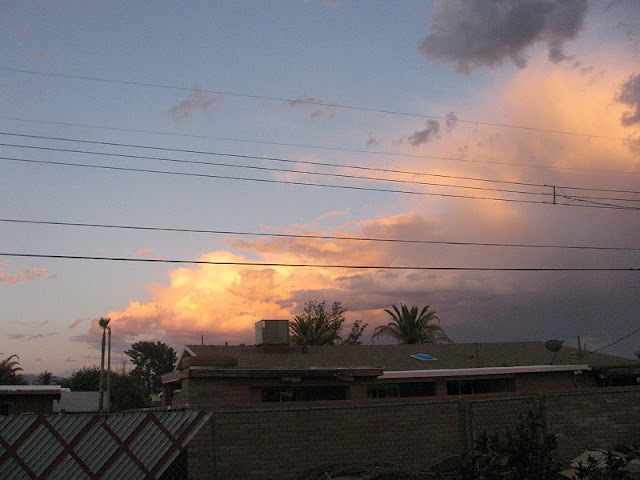 This time of year in Tucson, that means one thing: weather watching! Thing is, I don't seem to look so much up at the clouds as out at them. 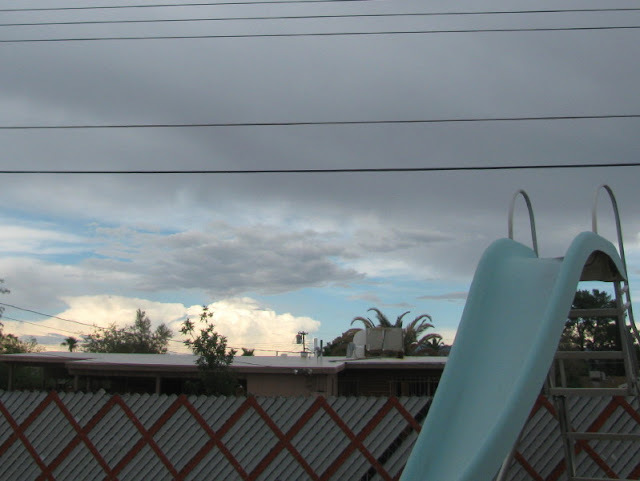 The interesting stuff is on the horizon, where the most interesting clouds tend to build up during the monsoon. 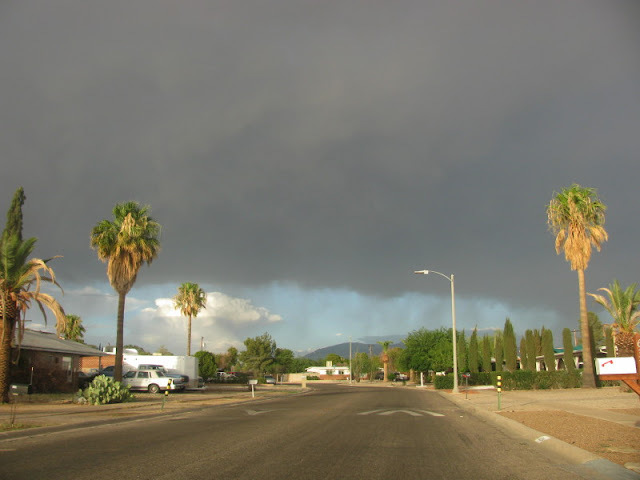 For example, I've seen this cloud to the north of the Rincon Mountains - or one very much like it - several times this week. Here's one worth looking up at! 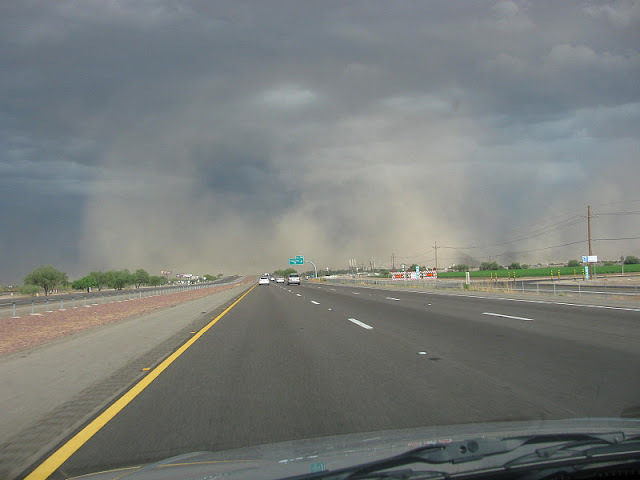 Apparently this was the same "haboob" that covered Phoeinix so dramatically an hour an a half later. Similarly, I have a black and white dog, sort of. Pepper just got groomed yesterday and is all pretty. Cayenne, of course, can't even pass for black and white. 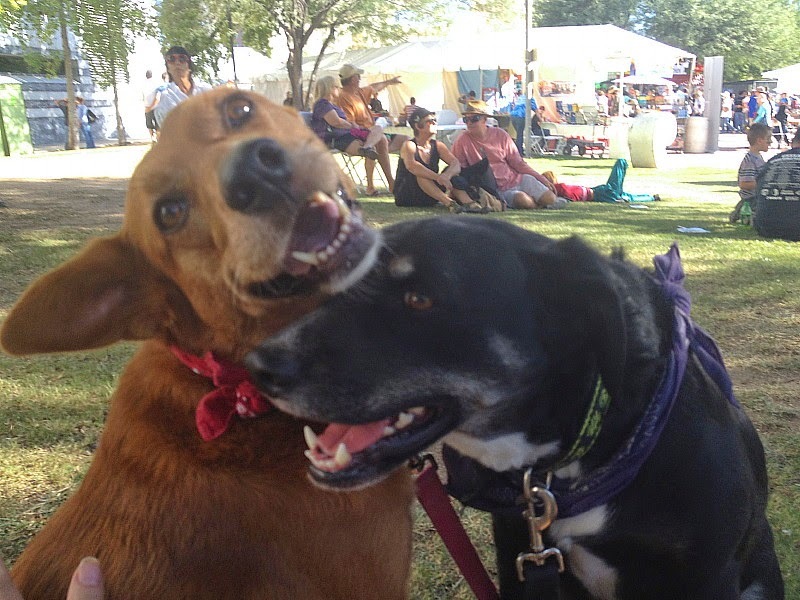 She's the Red Dog of the family! For the Round Robin Challenge: Signs of the Times, I asked to see photos of signs that in some way reflect the times we live in. Some of the signs I'm about to show you definitely meet that Challenge, while others are, well, a bit of a stretch. I'm going to show them to you anyway. This is definitely a sign of the times: a billboard advertising of of the many payday loan companies found on practically every street corner in Tucson. I worked inside one of these places for three days once, and I'm very glad the law that allows them to operate here runs out in another year or two. There must be a better way for people in a financial bind in these trying times to get by than to get ever further in debt to a payday lender. 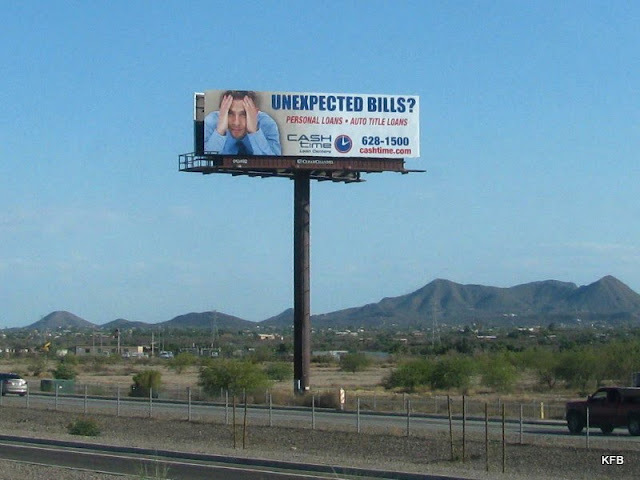 A few miles further north and west than the payday loan billboard is this classic. 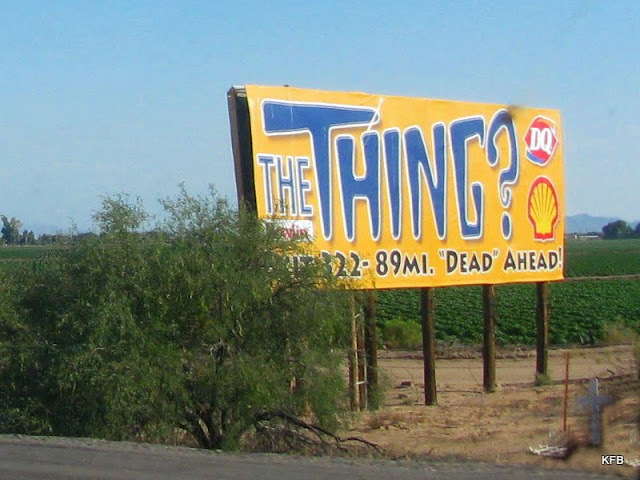 Like the South of the Border billboards in the Carolinas, The roadside attraction called The Thing? is touted for many miles in each direction along I-10. 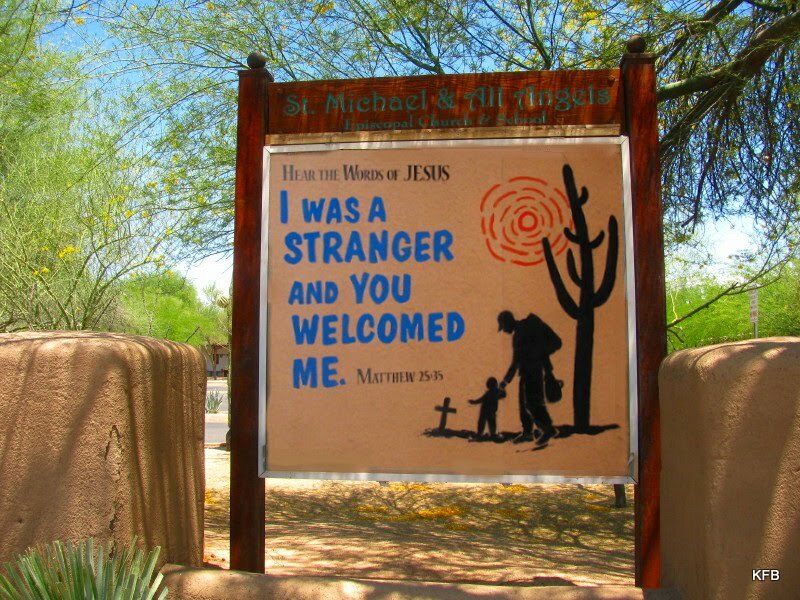 (It's at a truck stop/Dairy Queen/souvenir stand in Southeastern Arizona, more than an hour from Tucson and miles from anywhere. I went there once and paid the admission. It was sort of a Believe It Or Not type museum on the cheap, everything from a 1930s car reputed to have once carried Hitler to bizarre folk art to exhibits from history's junkyard, often accompanied by signs that work the words "THE THING" into the description. (A little video tour can be seen on the Roadside Attractions website.) The main attraction is a mummified...well, I'll leave you to guess. 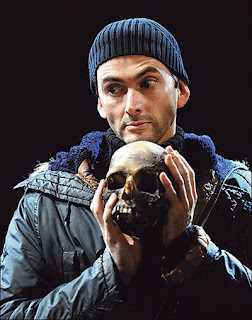 I don;t quite know what it is myself, and I've seen the Thing! The other sign is outside the large building under construction that I featured in the announcement for the BIG challenge a month ago. That "No Soliciting, No On-Site Hiring," along with the fence, seems a mite unfriendly to me, but it's more than that. 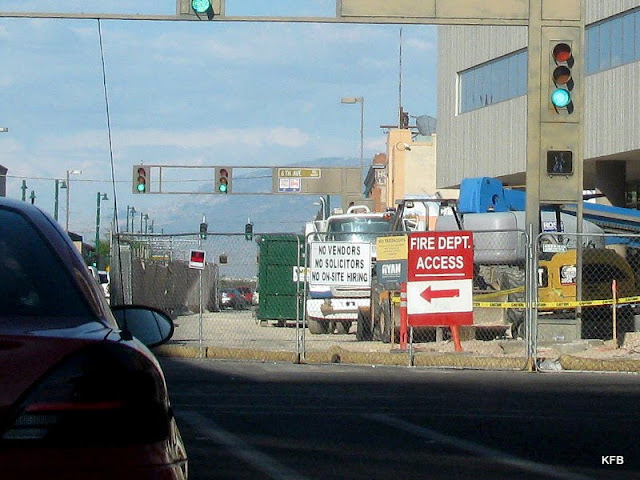 The construction industry in Arizona is notorious for hiring undocumented workers as day laborers, sometimes picking people up off the street for the work. Not at this worksite. I'm not saying that's good or bad per se, but it rubs me the wrong way. I happened upon this scene one day recently on a side street as I tried unsuccessfully to drive through a neighborhood instead of going back out onto grant Road. 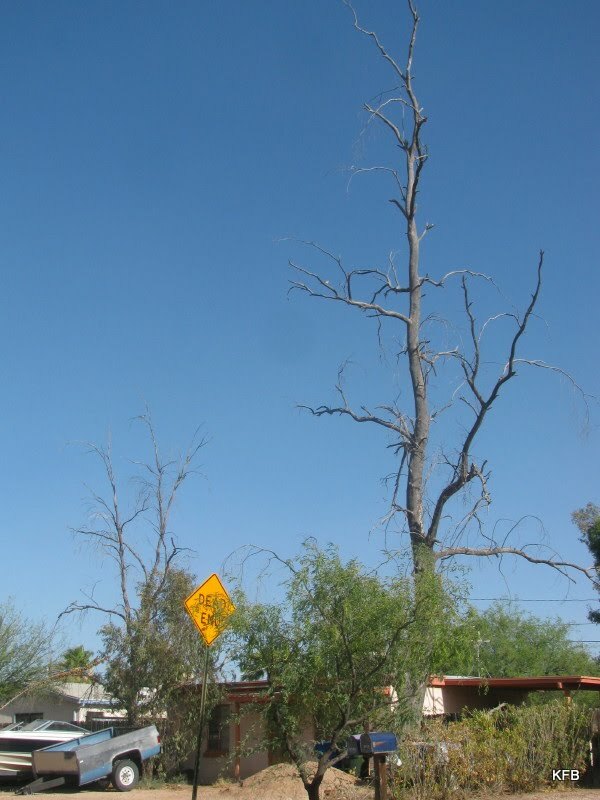 The Dead End sign next to the dead tree and the boat in the driveway of a landlocked desert city struck me as evocative if nothing else. Now let's see some other signs of the times! LG Tina - Posted Sunday!